Scared. Sad. Amused. | details in the fabric..
I’ve attached a sketch I did of a clown to this post, at the bottom. But not your normal happy-go-lucky clown. Nope, a sad clown, with tears dripping down his face. 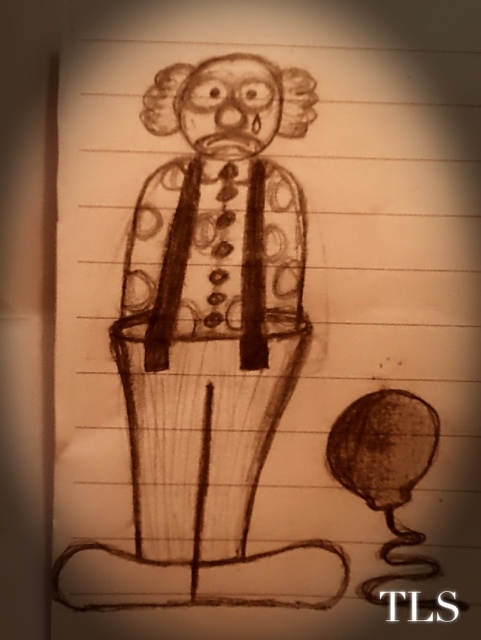 A failed entertainer, even a balloon wilting at his feet. I don’t like clowns. They scare me. I hate how they pretend; they physically paint a mask on themselves. They exaggerate their emotions, hiding behind jokes and frolics. They have to smile all the time. They repress their true feelings. I can’t read them like I can read humans. Also they’re just kinda freaky. Anyway, I’m feeling a lot right now. Freaking out about my final exams. Sad to be moving out, from the parents I’ve been with almost every day for 18 years. Happy cause they tend to drive me crazy. Tired. So tired. Disappointed in a few ‘friends’. Annoyed at how much I need to feel loved. Confused cause I don’t understand myself. Amused at my failures; all of the above. But I sympathise with everything that cries. Everything. An axe murderer bursting into tears after killing a baby kitten. He has my sympathy. Perhaps that’s a bit extreme, but you get my point. Crying normalises us. It’s natural. It’s true. It makes us human. So, a crying clown means I have to feel sympathy, I cant help myself. But the fact it’s a clown fills me with fear. I don’t know what it’s feeling. I don’t know who it is underneath the makeup. I can’t tell if it’s just an act. Didn’t want to go down the emotional route with blogging, but everyone has their days I guess. On a lighter note, one of my favourite quotes.. I should get that tattooed inside my brain. Previous They who drink beer will think beer. Next Sunny patches and frosty mornings.